Most animals have to deal with excess nitrogen, which they get from food. One of the common sources is the nitrogen in purines such as adenosine, guanosine, deoxyadenosine, and deoxyguanosine. These nucleosides are broken down into the bases adenine and guanine plus the sugars, ribose and deoxyribose. Adenine and guanine are converted to uric acid, via xanthine. Uric acid cannot be further metabolized in birds, some reptiles, and primates. These species excrete uric acid in their urine. They also excrete urea but this is derived from the breakdown of amino acids. All other species convert uric acid to allantoin. This is the end product for most mammals, turtles, some insects, and gastropods. 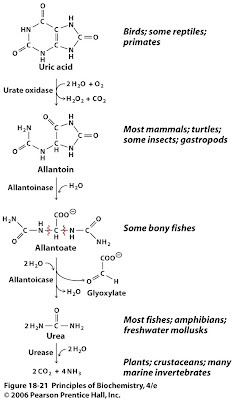 The remaining species can break down allantoin to allantoate and this product is excreted in some bony fishes. The next step in the degradation pathway is the splitting of allantoate to two molecules of urea. Urea derived from purines is excreted by most fishes, amphibians, and freshwater mollusks. The remaining animal species degrade urea to ammonia and carbon dioxide using the enzyme urease. In some cases the free bases adenine and guanine are salvaged to be used in synthesizing ATP, RNA, and DNA. The salvage pathways require special enzymes to recover the bases. Adenosine phosphoribosyltransferease converts adenine back to AMP and hypoxanthine-guanine phosphoribosyltransferase (HGPRT) salvages hypoxantinine and guanine. As with other pathways, defects in purine metabolism can have devastating effects. In 1964 Michael Lesch and William Nyhan described a severe metabolic disease characterized by mental retardation, palsylike spasticity, and a bizarre tendency toward self-mutilation. Individuals afflicted with this disease, called Lesch–Nyhan syndrome, rarely survive past childhood. Prominent biochemical features of the disease are the excretion of up to six times the normal amount of uric acid and a greatly increased rate of purine biosynthesis. The disease is caused by a hereditary deficiency of the activity of the enzyme hypoxanthine–guanine phosphoribosyltransferase ((HGPRT) [OMIM 300322]. The disease is usually restricted to males because the mutation is recessive and the gene for this enzyme is on the X chromosome (Xq26-27.2). 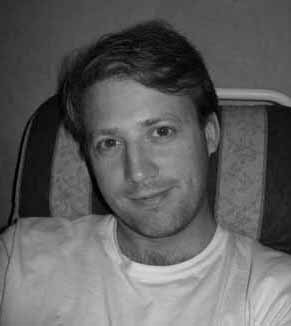 Lesch–Nyhan patients usually have less than 1% of the normal activity of the enzyme and most show a complete absence of activity. In the absence of hypoxanthine–guanine phosphoribosyltransferase, hypoxanthine and guanine are degraded to uric acid instead of being converted to IMP and GMP, respectively. The PRPP normally used for the salvage of hypoxanthine and guanine contributes to the synthesis of excessive amounts of IMP, and the surplus IMP is degraded to uric acid. It is not known how this single enzyme defect causes the various behavioral symptoms. The catastrophic effects of the deficiency indicate that in some cells the purine salvage pathway in humans is not just an energy-saving addendum to the central pathways of purine nucleotide metabolism. Gout is a disease caused by the overproduction or inadequate excretion of uric acid. Sodium urate is relatively insoluble, and when its concentration in blood is elevated, it can crystallize (sometimes along with uric acid) in soft tissues, especially the kidney, and in toes and joints. 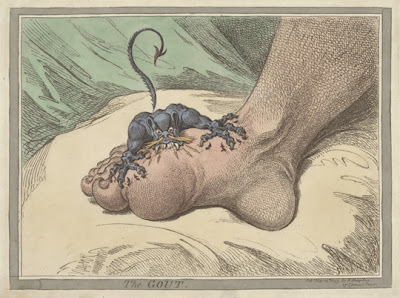 Gout has several causes, including a deficiency of hypoxanthine–guanine phosphoribosyltransferase activity, which results in less salvage of purines and more catabolic production of uric acid. The difference between gout and Lesch–Nyhan syndrome is due to the fact that gout patients retain up to 10% enzyme activity. Gout can also be caused by defective regulation of purine biosynthesis. Gout can be treated by giving patients allopurinol, a synthetic C-7, N-8 positional isomer of hypoxanthine. Allopurinol is converted in cells to oxypurinol, a powerful inhibitor of xanthine dehydrogenase. (Xanthine dehydrogenase is the enzyme responsible for synthesis of uric acid.) Administration of allopurinol prevents the formation of abnormally high levels of uric acid. Hypoxanthine and xanthine are more soluble than sodium urate and uric acid, and when they are not reused by salvage reactions, they are excreted. Allopurinol and oxypurinol. Xanthine dehydrogenase catalyzes the oxidation of allopurinol, an isomer of hypoxanthine. The product, oxypurinol, binds tightly to xanthine dehydrogenase, inhibiting the enzyme. Another informative and interesting post, thanks! Question: why do the relatively insoluble sodium urate and uric acid crystals tend to form in the toes? Does it have something to do with blood pressure at extremities, or the size of capillaries in toe joints? "Uric acid cannot be further metabolized in birds, some reptiles, and primates. These species excrete uric acid in their urine. They also excrete urea but this is derived from the breakdown of amino acids. All other species convert uric acid to allantoin. This is the end product for most mammals, turtles, some insects, and gastropods." As I'm sure you know, but others may not, birds, squamates, and tortoises go through the trouble and energetic expense of packaging most of their amino-acid-derived waste nitrogen as uric acid for excretion. Urates (potassium urate in herbivores, mostly sodium urate in insectivores) are precipitated out of solution in the bladder and/or cloaca and excreted with much less water loss than necessary to keep urea in solution. As I'm sure you know, but others may not, birds, squamates, and tortoises go through the trouble and energetic expense of packaging most of their amino-acid-derived waste nitrogen as uric acid for excretion. I read that in various sources but I haven't been able to confirm it in the scientific literature. 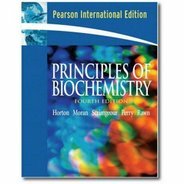 Do you have a reference other than a textbook? So what is the bottom line, is there anything invented that can dissolve uric acid and calcium oxylate stones?